In trying to decide what to bring to our Superbowl party yesterday, I found myself torn between wanting to make a dessert and wanting to make a more savory dish. 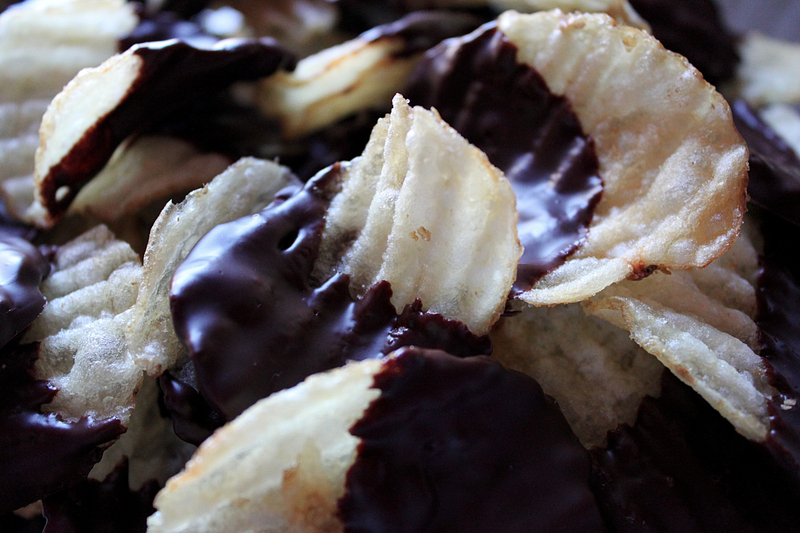 Fortunately, I remembered that a few months ago, I pinned this recipe for chocolate dipped potato chips from Spoon Fork Bacon (great foodie blog, btw). These guys satisfied both the sweet and salty flavors that I was looking for and they were beyond easy to make, requiring only two ingredients. Plus, they were a huge hit! I can’t wait to make them again! Recipe below. xoxo! Melt the chocolate in a double boiler. Using the largest chips first, dip half way and lay flat on a baking sheet lined with parchment paper to harden, about 30 minutes. Store in an air tight container and keep in a cool dry place. Enjoy! ← Have a Festive Weekend! Thanks! Chips in cupcakes?!! Mmmmmmm, I must try this!